Wooli – straight-talking, no-nonsense beauty sandwiched between the sea, meandering river and national park. 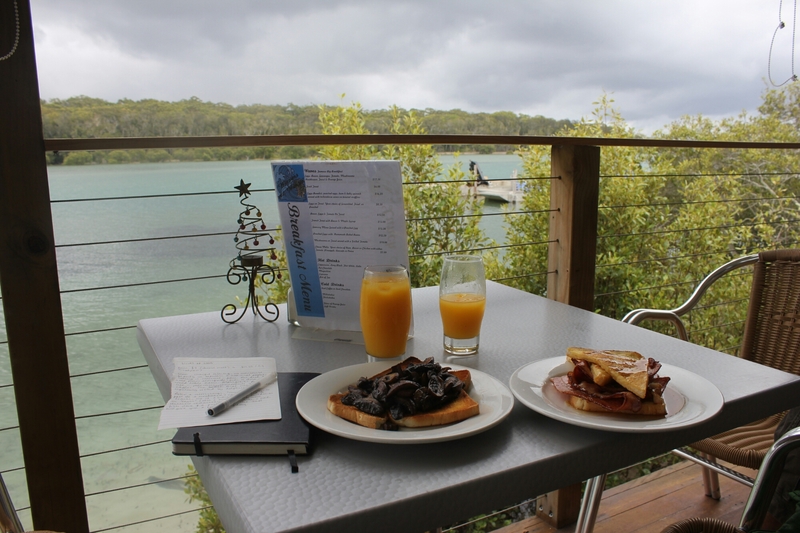 The brunch setting at Waves is sublime – from the back deck the river flows, the fish so close you could tickle them. The mangroves around are full of life: pelicans, cormorants and sea eagles face off against one another in the hope of bagging a morning snack; in the ocean across the road, dolphins can be spotted patrolling for their breakfast. After a morning’s “surf” (10 ways to fall off a surboard) we retreated to the cafe, one of a handful of buildings that makes up the bustling centre (there’s also a bowling club-chinese-bookies-pub, and a post office). The staff looked somewhat surprised as the two of us in an otherwise empty cafe created the morning rush, gave us a semi-friendly g’day and took our order. Flavours were simple – their mushrooms on toast constitutes mushrooms, and toast – but hearty, with excellent portion sizes and good quality ingredients. And, despite the warning from a fellow coffee snob, our flat whites were surprisingly good, too. This being Wooli, things run at their own pace. Drinks might turn up late and the staff might not always be on show, but a teenage kitchen porter can usually be rustled up if you really need something. And, with a setting as bucolic as this, you’re best to sit back and take you’re time anyway. Price: from $7 (cheese melt) to $17.50 (Big Breakfast).